"Shrek" and "Madagascar" have new digs. New movies are on the way, and new jobs are being sought. The red-hot technology market isn't just for iPads these days. Animated movies are also big business, and DreamWorks Animation is reaping the rewards. The company, bought by DreamWorks back when it was PDI (also Bay Area-based), has been on a hot streak. Now, it's got a new home. Hollywood mogul and company CEO Jeffrey Katzenberg cut the ribbon Thursday in Redwood City, alongside the ecstatic mayor , Alicia C. Aguirre. This is a deal where a company known for special effects will also help a community see ripple effects. New jobs (200 are needed), new housing, and new money. Everybody wins - especially local animators and engineers, who will now be wooed by both Pixar and DreamWorks. 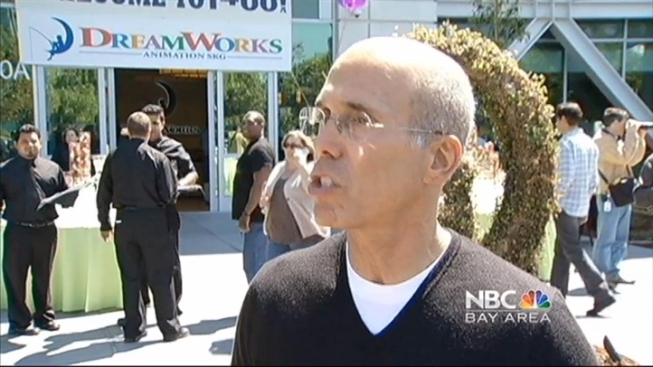 While employees sipped champagne, Katzenberg gamely posed with giant mascots from "Madagascar." In an interview, Katzenberg said: "The paintbrush of innovation is a computer. The talent for that is all here in Silicon Valley." Gail Curry, who heads the animation division, said job candidates love the fact that "they don't have to go to Hollywood" to get quality movie-making jobs. For the rest of us, it's just cool to see the movies. Maybe the best news? Katzenberg says DWA will soon make three of them a year, instead of the current two.